Draws flies in to feed with Muscamone® fly attractant. Flies die rapidly after feeding . Standard particle size to reduce dust. Can be used as a scatter bait or with a fly bait station. 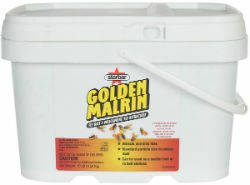 Golden Malrin® Fly Bait, featuring methomyl, can be used in rotation with QuikStrike® Fly Bait as part of an integrated program to fight flies and resistance.